Vättern is a special lake – both cold and deep – and on its western shore you’ll find Hjo, a town that is just as special as the lake. It was granted its town charter at the start of the 15th century and attracts visitors with its distinctive character and charm, well-preserved wooden buildings, cobbled streets and picturesque alleyways. See the verandas with their decorative wooden detailing and pretty patterned window frames on the buildings nestled in leafy gardens. If you sense the aroma of smoked European whitefish, let it lead you to the harbour that was once a dock for the entire Västergötland region. The harbour remains a hive of activity today. Go on a steamboat trip before settling down at a restaurant to savour the whitefish. 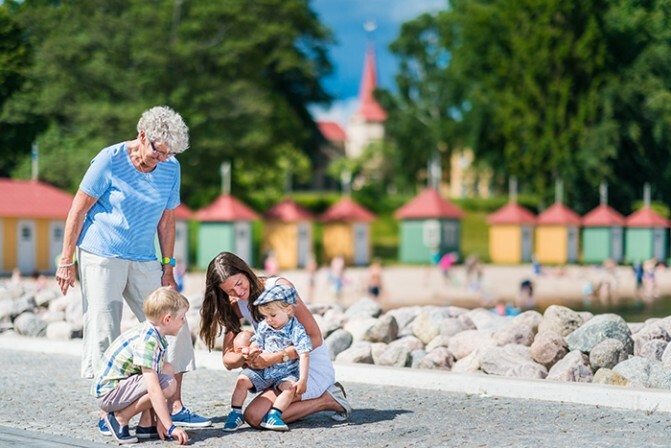 Hjo’s beautiful town park is nearby with its wooden villas that stand as proud reminders of the time when the park belonged to the former health spa Hjo Vattenkuranstalt. But before you make your way back to the town centre, unpack your picnic basket, sit down and enjoy a bite to eat. You can take a dip in the water, too – which is just as enjoyable as your visit to the rest of the town.